We are happy to source your rare parts, please email your needs. Parts are genuine unless stated reproduction. 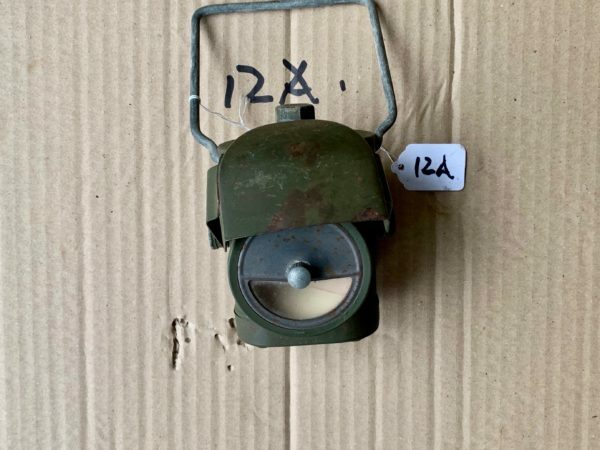 WW2 LAMPS ELECTRIC NO:1 OR BIVVY LAMP IN GOOD CONDITION . BSA 1ST PATTERN PARABIKE FOLDING FRAME . THIS IS A VERY EARLY FRAME AS ONLY HAS 2 BRACING SUPPORTS BENEATH CRANK HOUSING. STRAIGHT FRAME WITH SOME PITTING . BROUGHT BACK FROM FRANCE BY ME. THESE 3 X 75TH ANNIVERSARY PLAQUES HAVE BEEN MADE BY A LOCAL ARTIST , ALI RANCE . THEY ARE PAINTED ON METAL SHEET BASE . THEN LACQUERED . THEY ARE 12" X 7 1/2". (18.5 X 30 CM ). AS THEY ARE HAND PAINTED THEY HAVE SLIGHT DIFFERENCES AND ARE NUMBERED IN PICTURES . WARTIME CYCLE-BIVVY LAMP -COMPLETE . DARK EARTH PAINT . USED LAMP . LOOKS GOOD . BROOKS LADIES SADDLE -UNUSUAL SPRINGS . NICE BROOKS BADGE . NO IDEA WHAT THIS FITTED BUT MAY HELP SOMEONE WITRH PERIOD SADDLE . DUNLOP BICYCLE TYRE LEVERS -PAIR. LEFT SIDE PEDAL ROD AND CRANK. OFTEN MISSING WHEN CIIVY PEDALS HAVE BEEN ADDED POST WAR . BSA PARABIKE BARE FRAME . BICYCLE LEVER . -NOT PARABIKE BUT SIMILAR -BLADE IS PARABIKE TYPE . BSA BICYCLE BELL – POST WAR. NICE LOGO -NOT VERY OLD .WORKS . PERRY CHAIN. FOR PARABIKE -RARE.DISTINCTIVE SHAPE LIKE BSA CHAIN. PERRY CHAINS SEEM TO BE FOUND ON EARLIER PATTERN PARABIKES ALONG WITH BSA AND COVENTRY LATER IN WAR. SMALL TIN OF 5 X SCHRADER VALVE CORES . LEATHER CYCLE BAG -NOT MILITARY BUT PERIOD. COMPLETE WITH USEABLE STRAPS AND FASTENING. WILL CLEAN UP . LEATHER CYCLE CENTRE FRAME TOOLBAG. ORIGINAL WW2 FINISH ,GOOD CONDITION STRAPS BUT FLAP FIXING PAST IS MISSING. PNICE PERIOD LOOKING TIN WITH REMAINS OF CONTENTS . DISPLAY ONLY . GOOD CONDITION READY TO USE . AIRBORNE (PARABIKE ) FRONT WHEEL AND MODERN TYRE. dunlop rim good condition . COVENTRY CHAIN – COMPLETE . THESE ARE THE MOST COMMON CHAINS FOUND ON AIRBORNE BICYCLES . VERY FEW BSA CHAINS WERE USED . PERIOD MILITARY BELL – NOT BRITISH -cheaper alternative. CLIP FITTING -CADNIUM ,works but needs adjusting . DUNLOP ROADSTER BICYCLE TYRE PRESSURE GAUGE . NOT OFTEN SEEN SPECIFIC CYCLE GUAGE . DONT KNOW AGE BUT USEFUL PART. DUNLOP TYRE LEVERS – PERIOD PARTS . Not BSA but very similar, nice and complete and very period look. Repro . these are hard like originals ,not rubber if you drop them on hard floor they may chip like originals ! All genuine parts are over 70 years old. The description and images provided in no way guarantee the safety of any engines, gearboxes, mechanical or any parts in actual use. All parts are sold as restoration pieces which may or may not require replacement or additional components and testing if they are to be used in a fully working machine. All parts can be posted by signed for, special or courier delivery to UK, EU and worldwide at cost.